Astronomers in the U.S. have used the flickering of x-rays to pin down the mass of a black hole in the nearby galaxy M82, finding the black hole to be about 400 times as massive as the Sun. This means it is of the rarest, mid-sized black-hole type and raises the question of how these odd objects arise. Mass is a fundamental property of any black hole, which has so much gravity that nothing can escape its grip. Black holes come in two main types: stellar-mass black holes that are roughly 10 times as massive as the Sun, such as Cygnus X-1, and supermassive black holes, which are typically millions or billions of times as massive as the Sun and inhabit the centers of large galaxies. But there is a big gap between the two types. Intermediate-mass black holes "are much, much less studied compared with stellar and supermassive black holes," says Dheeraj Pasham, an astronomer at the University of Maryland in College Park. That's because intermediate-mass black holes are rare, with only one firm example ever identified. Now he says there is another confirmed candidate: the black hole M82 X-1. Previous mass estimates for this object ranged from just 20 solar masses to more than 1000, so astronomers did not know whether it was an ordinary stellar-mass black hole or a rare intermediate-mass black hole. Indeed, it was already suggested in 2006 that the black hole had an intermediate mass, but this had yet to be confirmed. 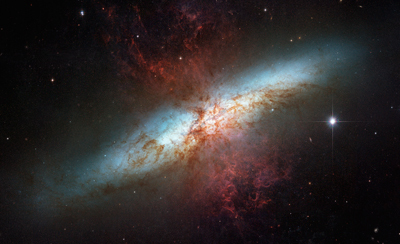 The black hole lies in M82, a "starburst" galaxy only 12 million light-years away, which spawns lots of new stars. M82 orbits M81, a giant spiral whose gravity stirs it up and triggers the starburst. Stars are often caught by a black hole's immense gravitational force and lose material to the objects. Before plunging into the black hole, though, the trapped stellar material gets so hot it emits x-rays. The team analyzed six years of x-ray observations and discovered two oscillations every 0.2 and 0.3 seconds. These periods indicate how long the hottest material takes to orbit the black hole and far exceed the periods of similar oscillations seen around stellar-mass black holes. The longer period suggests a much greater mass, because the more massive a black hole, the larger it is and the longer material takes to revolve around it. Using two different methods, the researchers conclude that M82's black hole is 428 ± 105 and 415 ± 63 times as massive as the Sun. "They've done a great job," says Chris Done, an astronomer at the University of Durham. "But I wouldn't bet a house on it just yet." She thinks the mass is more uncertain than they claim. Still, it probably falls into the intermediate range, because she says stellar-mass black holes, which arise from the explosion and collapse of a star, should not exceed 80 solar masses. "There's no real way we know of to make a black hole this massive," Done says. "To get to 400 solar masses is really pretty freaky!" Supermassive black holes grow to millions or billions of times the Sun's mass because they occupy galactic centers that attract stars and gas. But M82 X-1 is not at the center of its galaxy. Astronomers have suggested that one way in which this black hole could have grown to such an abnormal size is thanks to a cluster of stars near its location, which could have fed the object, before a massive star's approach ejected the black hole from the cluster.